Recent funding from the EU, the Swedish Research Council (VR), and Chalmers University of Technology aims to increase the scientific impact of ESS through support of the ESS Data Management & Software Centre. COPENHAGEN—The European Spallation Source (ESS) Data Management & Software Centre (DMSC) has rapidly positioned itself as an essential partner in broader European efforts to improve both the software and general protocols of scientific computing. Such initiatives are in turn critical to the DMSC’s mission to maximise the scientific impact of research to be performed at ESS. The European Commission’s grant of €10 million to the European Open Science Cloud (EOSC) will enable the 33 partners in this important long-term initiative to establish a strong formal foundation. The two-year pilot project is led by the UK’s Science & Technology Facilities Council (STFC) and began on January 17. The EOSC mission is to “support the creation of a trusted and open environment for the European scientific community to share, store and re-use scientific data”. The pilot project will establish needed foundations for development, such as broad user access, a business model and governance structure, and global standards for interoperability. Other consortiums have formed around the need to improve data modelling software that will directly impact the future users of ESS. The Swedish Research Council, known by the Swedish-language acronym VR, has recently funded two multi-year projects in this area that will begin in 2017. The first, led by Lund University, aims to improve data modelling of time-resolved small-angle neutron scattering (SANS) techniques, and will begin in August. The DMSC’s Wojciech Potrzebowski will dedicate half his working time to this project. The second VR-funded project, to begin this month, will be led by Chalmers University of Technology with the aim to improve computer modelling of molecular dynamics. Data Analysis and Modelling Group Leader Thomas Holm Rod will play a key role in both initiatives, which are intended to maximise performance of instruments under construction for ESS. A fourth project at the DMSC is already underway. It is a close collaboration with Chalmers’ Erhart Group, a data modelling software development group at the university. The purpose is to both exchange expertise and to make wider use of the modelling tools being developed at Chalmers University. A post-doc has already been recruited to support the project. 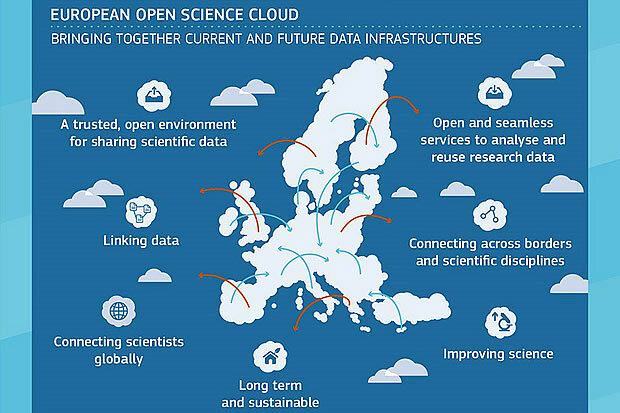 A European initiative to support the first development phase the European Open Science Cloud (EOSC) received 9.9 MEUR in funding through the EC’s Horizon 2020 program. The two-year EOSCpilot project connects 33 partner organisations from 11 countries to establish the foundations of the EOSC. The service portfolio work package will demonstrate that diverse science cases can be enabled through a coherent portfolio of EOSC services that are drawn from and built upon existing national and European e-infrastructures and initiatives. The future EOSC service portfolio should enable researchers from all disciplines to have seamless, open access to the advanced digital capabilities, resources and expertise they need to collaborate and to carry out data- and computing-intensive science. Help scientists through the use of cloud technology to gain access to federated resources for data analysis. Demonstrate in cooperation with other work packages the feasibility of providing technical services in the context of large-analysis facilities. 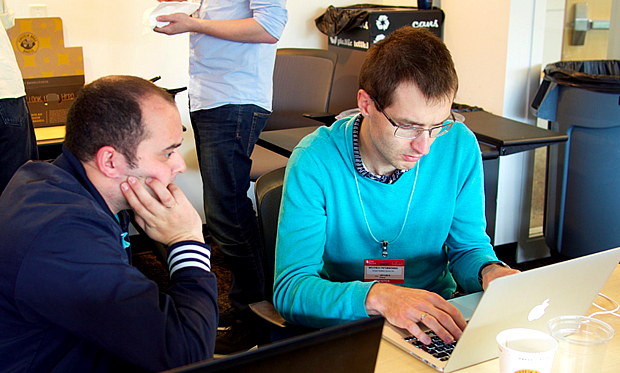 Collect requirements of the scientific communities for future cloud solutions for technical and socio-economic issues. This project will be led by Ingemar André from the Department of Biochemistry and Structural Biology, Lund University. The other partners in the project are Najet Mahmoudi from ISIS, STFC, and Wojciech Potrzebowski and Thomas Holm Rod from the European Spallation Source (DMSC). Moreover, a post doc will be recruited in the project. 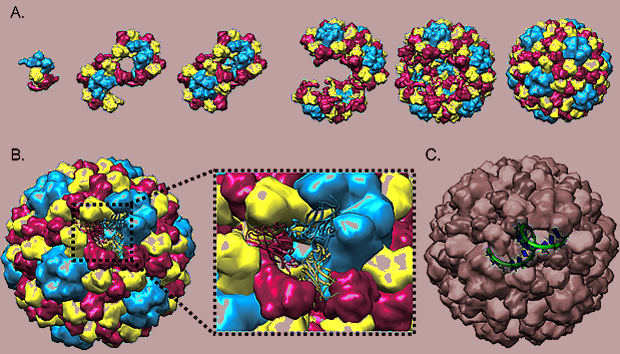 Conceptual figure from the DMSC proposal to VR: Virus capsid assembly closeup. A) An hypothetical assembly pathway of cowpea chlorotic motile virus (CCMV) capsid. B) The high-resolution structure of the fully formed capsid determined using X-ray crystallography (PDB code: 1AZ7). C) Single-stranded RNA encapsulated in the inner shell of CCMV. Molecular self-assembly is a central concept in chemistry, soft matter physics and biology. In biology, the spontaneous association of smaller building blocks into more complex functional assemblies – membranes, folded proteins and protein complexes – is key to understanding life processes at the molecular level. In this project we aim to develop a computational method to analyze time-resolved Small Angle Neutron Scattering (TR-SANS) data from studies of biological self-assembly processes. The method builds upon a Bayesian probabilistic modeling framework that enable determination of detailed molecular self-association pathways with limited overfitting to experimental data. A second aim is to make the methodology available for the neutron scattering user community by implementing the methodology into existing software for modeling and analysis of SANS data, e.g. SASview. The third aim is to develop an experimental framework for recording TR-SANS data for studying the self-assembling of virus protein capsids. Data from this framework will be analyzed with the newly developed computational methods to illustrate the power of the framework and to advance our understanding of virus biology. This project will be led by Jan Swenson from the Department of Physics, Chalmers University of Technology. Other partners are Heloisa N. Bordallo from the Niels Bohr Institute, University of Copenhagen, Anders Markvardsen from the STFC ISIS neutron source in the UK, and Thomas H. Rod from the European Spallation Source DMSC. A post doc will be recruited in the project. The aim of this project is to overcome the challenge with interpreting and understanding inelastic and quasielastic neutron scattering data by developing a new computer modelling method to model the dynamic structure factor. The dynamic structure factor will be calculated from molecular dynamics simulation where the interatomic potentials will be changed until a quantitative agreement is obtained between the calculated S(Q,w) and the measured S(Q,w). Hence, the method is a dynamical correspondence to the Empirical Potential Structure Refinement (EPSR) method used to produce structural models of materials in quantitative agreement with neutron and x-ray diffraction data. It is foreseen that this new approach will have the same significant impact on understanding the dynamics of materials as EPSR has had for understanding the structure of materials and it will thus be possible to obtain a deeper understanding of how the macroscopic properties of materials depend on the molecular motions in them of importance for the development of new materials. It is the aspiration that not only the neutron spectroscopy user community will benefit significantly from this new method but also that the computer simulation community will get a unique possibility to refine model potentials on the basis of neutron spectroscopy. 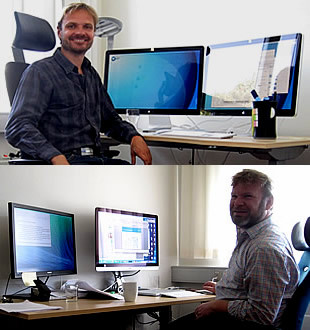 The aim of this two-year collaboration between the Erhart Group and the Data Analysis and Modelling Group at ESS is to exploit one another’s strengths in modelling and software development, respectively, to make the software tools developed by the Erhart Group accessible to a much wider user community, including the future users of ESS. Additionally, the goal is to make it possible for third-party developers to contribute to the software by improving the user experience, adding new functionalities, converting the software to open-source software and employing best practice software development methodologies. Countless materials of technological importance as well as fundamental interest exhibit some form of chemical ordering. Both metal and semiconductor alloys are prototypical examples but there are also less obvious cases such as clathrates and other Zintl compounds, cobaltates, or skudderudites. In all of these materials at least two different components compete for equivalent sites, the occupation of which is determined by a complex interplay of entropy and energy. While the former drives the system toward disorder, attractive interactions between species provide a counter force, which leads to ordering. The distribution of the constituents of a material on the microscopic scale often has direct implications for the macroscopic response including but not limited to mechanical, thermal, catalytic, electrical, and magnetic properties and it is thus vital to understand these mechanisms in order to understand the properties of a material and how to develop novel materials. While experimental techniques, such as neutron diffraction, can yield tremendous insight, they still require models and assumptions in order to interpret the results. Over the course of the last years, the Erhart Group at Chalmers University of Technology has developed software based on the so-called cluster expansion and compressive sampling techniques and is currently employing these codes to study chemical ordering in inorganic clathrates, the coupling between transport properties and order, alloying of nanoparticles, and refractory alloys.